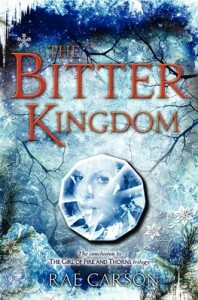 As someone who's just started reading and appreciating YA fantasy, I've enjoyed this trilogy so much.Crown of Embers is still my favorite book in the trilogy, but I thought that The Bitter Kindgom was a fitting end to Elisa's story, with plenty of romance, heartbreak, suspense and sacrifice. As was the case when I started book two, Crown of Embers, it took me a few chapters to get myself oriented and immersed back into the story world. I could have used a little more recap. There was a lot of travel and action in this book -- plotting and hiding and fight scenes and a whole underground sequence that reminded me a lot of Indiana Jones and the Temple of Doom. I'm claustrophobic, so this is not my favorite kind of setting! I also didn't feel that Elisa grew as much as a character in this book. On the one hand, I was happy that she's grown so confident, but her lack of confidence in prior books made her more relatable. 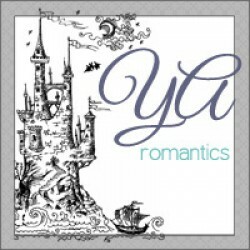 I also thought the romantic tension was higher in other books -- this segment of the story is more about Elisa.My complete review -- with a summary of all the things I love about the series -- will be on my blog -- Jen @ YA Romantics -- the week of August 10.